A urinary catheter is a hollow flexible tube that drains urine from your bladder. A catheter is usually used when people have difficulty passing urine or have difficulty completely emptying their bladder. You may need a catheter for a short period, such as before or after surgery, or you may need it long term or permanently. 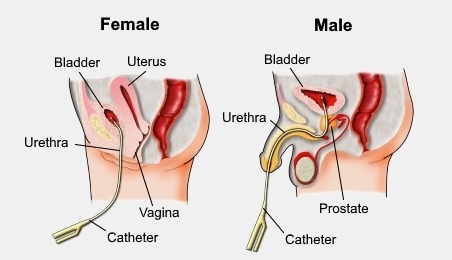 A urinary catheter can be fitted through your urethra (the tube that carries urine from your bladder). This is called a urethral catheter. A catheter can also be fitted through the wall of your stomach. This is called a suprapubic catheter. In both cases, a small inflated balloon keeps the catheter in place. Urine flows through the catheter and collects in a drainage bag that's connected to the end of the tube. A nurse may change your drainage bag or you may be taught to do it yourself. Your medical team will discuss this with you, as well as how often your bags are changed. You can secure the day bag to your thigh or calf using straps. You can attach the bag to whichever side feels most comfortable. You should always keep the bag lower than your bladder. The drainage bag has a valve at the bottom that you open to drain the urine that's been collected. You'll be taught how to do this. You should empty the drainage bag every three to four hours during the day, or before the bag overfills. Some people with catheters use a catheter valve, with or without a drainage bag. When the valve is closed, it stops the urine draining from your bladder. You should open the valve every three to four hours or when your bladder feels full so the urine can drain into the toilet or a container. At night, you'll connect the day bag (or valve) to a larger bag called a night bag. You'll open the valve at the bottom of the day bag to allow the urine to drain freely into the night bag. This is so you don't have to wake up to empty your bag overnight and so you can move around when in bed. You should place the night bag lower than your bed. Placing it in a container such as an ice cream container is a good idea in case there's any leakage. In the morning, you'll close the valve at the bottom of the day bag and disconnect the night bag. You can empty the collected urine down the toilet. Clean the night bag after each use with warm soapy water and allow it to dry thoroughly. Store the dried bag in a clean sealed plastic bag ready for the next time you use it. Always wash your hands with warm water and soap after touching your catheter equipment. Maintain good personal hygiene by washing yourself daily with soap and water. Wash the area around where the catheter enters your body with soap and water daily. Dry it well with a soft towel. Don't use talcum powder or creams around the catheter unless your doctor has prescribed them. Avoid getting constipated as this can affect your urine flow. Avoid having kinks in your catheter tubing. If you need a catheter for a long period, your doctor or nurse will arrange for the District Nursing Service to manage your catheter needs. The District Nursing Service will contact you once they receive the referral. Hours: Monday to Friday, 8.30 am to 4.30 pm. You can also have your supplies delivered to your home by courier for a fee. If you go away on holiday, remember to tell the Nurse Maude Supply Department and arrange to take any supplies you may need with you. Canterbury DHB – You and your catheter – Looking after your catheter at home. Issued by: Urology Department, Christchurch Hospital. January 2015. Authorised by: Clinical Director, Urology Department. Ref:1351. NHS – Urinary catheter, retrieved April 2018.